Three years after losing a ten-week strike over the right to collect dues, about 200 union members at Manitowoc Cranes in northeast Wisconsin face continuing efforts to decimate their treasury—an experience other unions may soon also face under the state’s new so-called “right to work” law. Brault won’t say the “S” word or give an opinion about workers who don’t pay dues. According to the company’s post-strike harassment policy, “I would lose my job,” he said. The collective bargaining agreement includes an annual period during which workers can opt out of the union. As that period approaches, management exhorts workers in person and in letters to discontinue dues and get union wages, benefits, and representation for free. 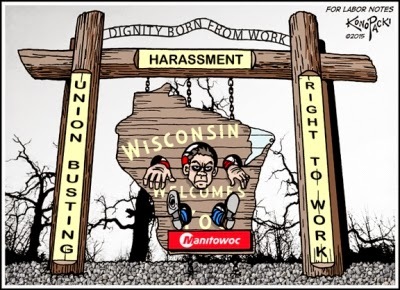 Right to work does not yet apply to the Manitowoc workers, outside of this opt-out period, since they signed their contract before the law was passed. But once the contract expires in 2016, right to work will prevail—and the company can make a non-stop push for workers to opt out. IAM members at another unit, Manitowoc Food Services, ratified a fourth one-year contract just days after right to work became law and as their jobs are being offshored to Mexico. They got a small signing bonus instead of a raise and elimination of rules requiring workers to pay dues. Local president Steve Garber said the company’s “whole attitude has gotten worse” in recent years under a series of “very anti-union” negotiators who don’t stick around for long. Both units are part of Manitowoc Company, headed by CEO Glen Tellock. He’s on the board of Wisconsin Manufacturers & Commerce, which championed Governor Scott Walker’s 2011 Act 10 stripping public sector unions of funding and bargaining rights, followed in 2015 by right to work for the private sector. The laws are products of the corporate/billionaire-funded bill mill, the American Legislative Exchange Council (ALEC). Right to work comes with a Class A misdemeanor. Requiring dues payments could mean nine months in jail and/or a $10,000 fine for each violation. 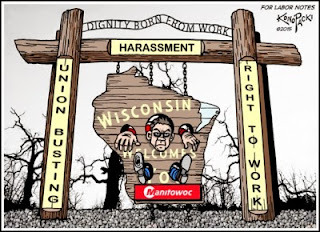 The anti-union National Right to Work Legal Defense Foundation, however, stands ready. The day after Walker signed right to work, the business-backed Foundation announced “free legal aid” to Wisconsin workers who don’t want to pay for representation. Five decades of symbiotic labor relations are now history, and the typical IAM member—well over 40 with about 25 years’ seniority—faces an uncertain future. Local secretary-treasurer Gary Dworak expressed a sentiment likely shared by many. > The article above was written by Kathy Wilkes, and is reprinted from Labor Notes.